The Bishop of London has today announced, on the first day of the Ashes Test at Lord’s, that 16 July is to become a Holy Day in London to mark the commemoration of the three Studd Brothers – whose family name is inscribed on the Ashes urn. Charles Thomas Studd (‘CT’), George Brown Studd (‘GB’) and Sir John Edward Kynaston Studd (‘JEK’) were not only renowned cricketers, two of whom were involved at the birth of the Ashes itself, but also highly committed evangelical Christians. CT and GB became missionaries and JEK President of the Marylebone Cricket Club. In their memory, the Bishop of London has now added the three brothers to the London Kalendar, a list of Holy Days for use in the Diocese of London. The brothers were nominated for inclusion by the Revd Michael Redman, Curate in the Parish of St Paul, St Marylebone. “The Studd brothers were great servants of two of this country’s most historic institutions: the Church; and the game of cricket. May their memory inspire England as they take on Australia this week at Lord’s. 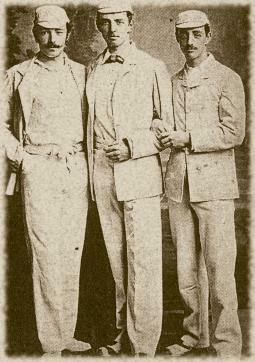 The Studd Brothers were from a large cricketing and evangelical family. All three captained Cambridge University, played for Middlesex and one, CT, played for England in the test match giving rise to the Ashes. CT was in the losing Engish side in the 1882 Oval match which prompted the Sporting Times mock obituary, ‘The body will be cremated and the Ashes taken to Australia’. CT and GB were both members of the touring side which recovered the Ashes in the winter of 1882-1883 during which the England captain was presented with the famous urn. CT went out to China on missionary work and remained there between 1885 and 1895. Invalided home, he did missionary work in England and America. He then went as a missionary to the Belgian Congo. Wisden records that ‘despite numerous illnesses and many hardships, devoted the remainder of his life to missionary work there.’ In the Congo, he built a church whose aisle measured 22 yards from end to end. Like his brother, GB also became a missionary working in India and China and then in Los Angeles where he became principal of a theological college. Having been prominent in evangelical work in the Cambridge Inter-Collegiate Christian Union, JEK in later life gave a Christian ethos to the Regent Street Polytechnic (now the University of Westminster) fulfilling many roles there and ending up President. He was Lord Mayor of London in 1928 and President of the Marylebone Cricket Club in 1930.